Tired of trying to keep your makeup in place? Even your waterproof makeup buys seem to have become useless with the appearance of summer? A good quality makeup setting spray is what you need. For people living in a hot and humid weather keeping the makeup in its right place can be a real challenge. The problem is even more acute for people with oily skin. As they sweat more, they often end up with a washed off face even before the sun starts to go west. Setting powder is not actually the best option if you are planning to keep your makeup in its place from dawn to dusk. To make your look last all day even if you have oily skin, you need a good makeup setting spray. Here we have come up with a list of the Best Makeup Setting Spray for Oily Skin; so that you can make the right pick and say bye to your makeup setting worries. Why you should use a makeup setting spray? Well, the answer is simple, to stop your makeup from melting, fading and cracking. Even the best quality waterproof makeups are often not able to offer the best staying power due to oil, sweat and heat. If you have oily skin, making all the makeup stick to your face properly for over a long period of time particularly during the hot and humid season is next to impossible. This is where the makeup setting sprays pitch in. These sprays are formulated with some special ingredients that create a transparent protective cover on your makeup. This veil adds a fresh look to the makeup and also ensures that it does not melt, fade or crack. The best quality makeup setting sprays can make your makeup last the whole day without the need of touch ups. Setting powder might be effective to keep your makeup in place to some extent, but in the long run it is sure to fail. Moreover, repeated application of setting powder is sure to give you a caked look. The top-notch makeup setting sprays on the other hand, ensures that there are no caking or cracking in the makeup. They rather add a velvety smooth finish to the makeup, which is highly desirable. 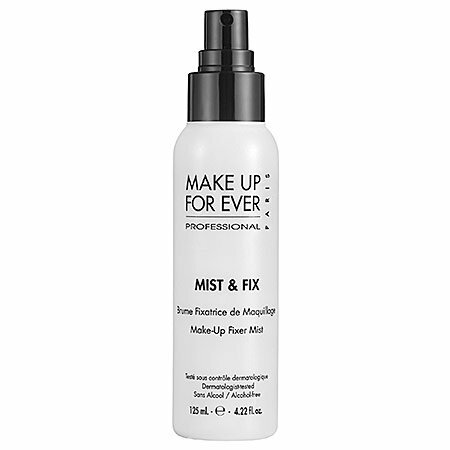 For people in look out of a high quality setting spray, this Mist and Fix formulation from Make Up For Ever can do the real job. This product has a nourishing, alcohol free formula which makes it ideal for sensitive skin. It is claimed to be a good option for every skin type, but we would like to recommend it particularly for oily, sensitive skin because of its gentle formula. This makeup setting spray gets its skin protective properties from chitosan extract, which is a marine alga. It protects the skin from damages caused by changes in temperature, skin irritants and pollutants. Apart from chitosan it also contains Vitamin E which offers anti-aging benefits while giving the skin a natural sheen. As already mentioned the formula is free from alcohol. This setting spray has a mess free application. Simply hold the can at your arm’s distance from the face and spray after completing your makeup. Do not forget to shake the can well before you start spraying. 1-2 sprays for each side of your face is sufficient. Always keep your eyes and mouth closed while using the spray. If you are going out to a party from work, simply spray the mist in a thick tissue and pat it on the face. It will give an instant fresh look to the existing makeup. You can add a layer of compact over it and get going. According to users, MAKE UP FOR EVER Mist & Fix Setting Spray is an easy to use product that can add a commendable fresh look to your makeup. It is absorbed very quickly into the skin and gives a fresh look to the makeup instantly. This setting spray erases the powdery look of makeup and settles in a finish that is not very matte or dewy, rather looks perfectly natural. It adds a glow to the skin that looks healthy. Though it last for hours on the skin, it does not make the skin dry. This makeup setting spray is light on the skin and it does not feel heavy or sticky after application. It is effective in setting every type of makeup and prolongs their staying power considerably even during humid summer days. This spray creates a light and transparent film on the skin which protects the makeup all day long. It gives the complexion a velvety finish. The spray does not disturb the makeup up which is the primary USP of this product. Dries off quickly after application and you need not to wait for it to get dry. Adds a fresh and natural finish to the makeup instantly. It has a fragrance, which might not be liked by some but it is not overpowering in anyway. The price is towards the higher end. MAKE UP FOR EVER Mist & Fix setting spray is one of the few products in the market that actually delivers what it claims. It is suitable for the oily skin and will not break you out. The price is towards the higher end but the quantity you get for the price is good enough and can last you for quite some time. Now even oily skinned beauties can forget smudged makeup and repeated touch ups thanks to the L’Oreal Paris Cosmetics Infallible Pro-Spray and Makeup Extender. This light weight facial mist seals in your makeup at its place efficiently. It does not budge the makeup and neither feels heavy on the skin, which is certainly a big plus point. The barely there feel of this pro-spray you are sure to love. It is free from oil, which makes it one of the Best Makeup Setting Spray for Oily Skin. Apart from a bunch of setting ingredients, this spray also contains Aloe Vera extract which is known for offering a good load of skin soothing and anti-aging benefits. Aloe Vera also helps in protecting the skin from damaging effects of the sun and pollutants. First shake it well and then hold the can at around 8 to 10 inches away from your face. Close the eyes and mouth. Spray in an “X” and “T” motion on your face. Repeat 4-6 times. Give few seconds for the spray to dry out and you are ready to move on. The spray evaporates quickly. So, you really need not to wait much for it to set in. This mist provides a veil on the face which protects makeup of any type from smudging. It even works to keep all the makeup glitters in place, which is really commendable. This setting spray does not add any shine to the skin. It feels light and does not add any artificial look to the makeup. The bottle dispenses a fine mist that spreads easily on the skin. It evaporates pretty quickly without adding any wet feeling on the skin. Being free from oil it is an ideal setting spray for the oily skinned beauties during summer, but the formula can be drying for the dry skinned girls. A single spray of this setting mist can hold your makeup in its place for the whole day, which is really amazing. It does not melt or fade away over time. Stays the same on your skin. It prevents cracking of your makeup. It dries out quickly without leaving behind any residue or sticky feeling. The mist is dispensed in a very even manner from the nozzle, which makes application really easy and minimum time consuming. The product comes for a reasonable price, particularly considering the quantity. This makeup setting spray is good to hold your makeup in place for around 6 hours but not more particularly on oily skin and during hot summer days. It is not at all hydrating on the skin. Hence dry skinned girls should use a proper moisturizer underneath before using it. 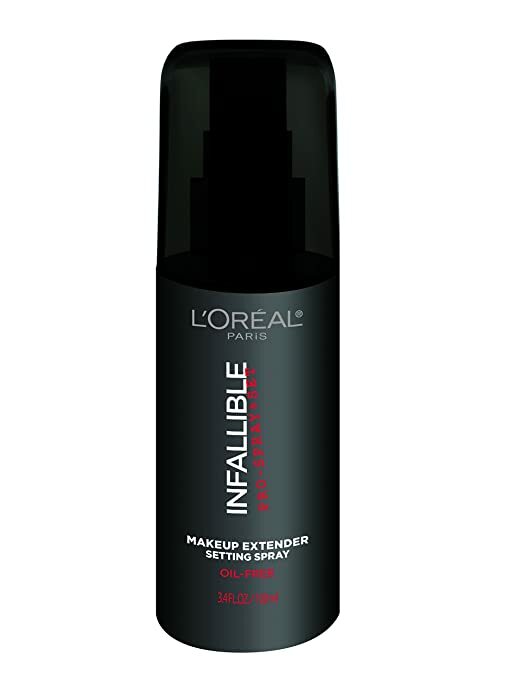 L’Oreal Paris Cosmetics Infallible Pro-Spray and Makeup Extender is a reasonably priced makeup setting spray that can be a good pick for the oily skinned girls and ladies. Though it does not make your makeup stay for the whole day, it adds fairly decent staying power to the makeup. Easy application and oil free formula makes it one of the best makeup setting sprays for oily skin. With the goodness and miraculous abilities of white charcoal this mattifying makeup setting spray from boscia presents some tall claims. It promises to minimize pores while mattifying the skin without drying it out. It is priced towards the higher end and the claims really set our hopes high. Does it perform according to the claims? Or like many other products in the market it is also only a great hype? Let us take a look if this setting spray really works for oily skin or not. First let us take a quick look at the ingredients. This makeup setting spray is infused with white charcoal powder, which helps in locking the moisture in the skin and gives long term skin benefits. This one is one of the few makeup setting sprays in the market that comes with a bunch of herbal extracts and apart from setting makeup also offers serious anti-aging benefits. Some of the organic ingredients that needs special mentioning include, cucumber extract, jojoba seed extract, eucalyptus leaf oil and rosemary leaf oil. Apart from these it also contains kaolin, which is highly soothing and nourishing for the skin. It is free from artificial fragrance, color, preservative and gluten. Yes, the ingredients of the boscia White Charcoal Mattifying MakeUp Setting Spray actually make us set the expectations quite high. Application is usual. Shake the can well, hold it at arm’s distance and spray on your face. However, the mist is not very light, particularly when it is just sprayed. Hence, it is important to maintain caution while applying. A large, uneven spray of this product can make all your contouring vanish if not used in the right way. However, it is absorbed into the skin pretty quickly and dabbing it on helps in setting any residues smoothly. If you are in the lookout for the Best Makeup Setting Spray for Oily Skin, you need to give this setting spray a try. This is not very light on skin but the results it offers are truly marvelous, particularly on oily skin. It melts onto the skin, giving an even toned finish that looks perfect and stays put for more than 8 hours, even under highly humid conditions. It helps in keeping every type of makeup in place, without adding any powdery or artificial look to them. This spray delivers what it claims. This setting spray is hydrating for the skin and yet gives mattifying effects, you cannot really ask for more. It does not affect the finish or the color of the makeup when applied in the right way. It helps in hiding the pores nicely and will give your skin a flawless look. Adds a glow to the skin. It sets makeup perfectly and also hides any minor imperfections in makeup. With regular use it improves the skin complexion as well as skin texture. Does not irritate sensitive skin and is safe for acne prone skin as well. This setting spray is not as light as many other members in this list. It is the nourishing ingredients along with white charcoal and kaolin which makes it towards the heavier side. It needs frequent shaking of the bottle even in-between applications for proper dispensing of the mist. This spray has a smell that lingers and might not be liked by all. 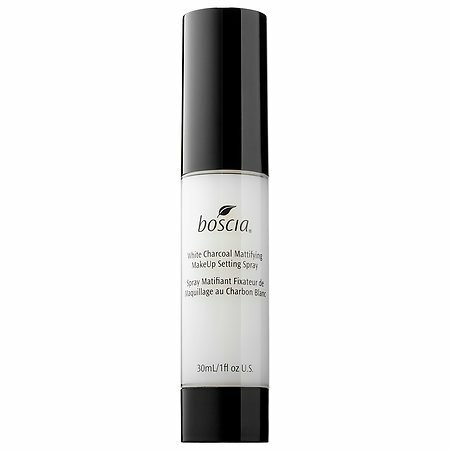 boscia White Charcoal Mattifying MakeUp Setting Spray certainly has its share of cons but the benefits it offer are truly remarkable. It delivers exactly what it claims and for many oily skinned beauties this is the ultimate product of their choice. If you are using a setting spray for the first time, this one might not be the best buy as it has a somewhat tricky application. However, if you are a pro, you can easily deal with the minor cons of this product and enjoy the list of pros. Another commendable contender in the market, All Nighter Long-Lasting Makeup Setting Spray claims to do miracle to the lasting ability of all your makeup buys. It claims to make any type of makeup last really long. Even if you are going for a night long party directly from your office, this spray can help to hold the fresh, just applied makeup look for you. A makeup setting spray is sure to come with a bunch of chemical ingredients and this one is no exception. However, it does not contain parabens, phthalates or sulfates which might be a relief for you. Apart from the chemical ingredients, it also contains Aloe Vera leaf extract and Vitamin E, which protects the skin and offer anti-aging benefits. These constituents also help in giving your face a fresh look. Urban Decay All Nighter Long-Lasting Makeup Setting Spray is exclusively for applying right after you have taken your makeup. It works best only on freshly applied makeup. So, if you are planning to use the mist on your existing makeup and then use a light dose of compact over it before going out, this product is certainly not the best choice. However, the application is easy. Shake the bottle well and spray it on your face in an “X” and “T” motion holding the bottle at an arm’s length. You will need to spray two to four times on the face to set your makeup completely. 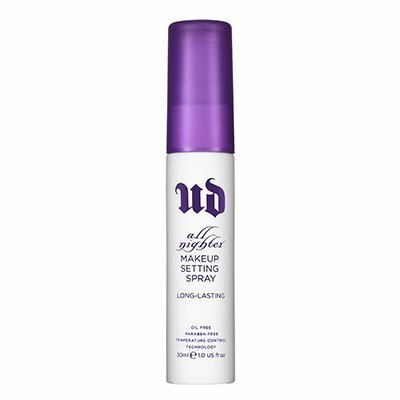 This Urban Decay All Nighter Long-Lasting Makeup Setting Spray is effective. However, the up to 16 hour makeup holding ability is quite a tall claim that it does not exactly satisfy. Microfine mist comes out of the sprayer without any effort and it spreads easily on the skin. The mist does not make the face very wet, which might budge the makeup. It has a cooling effect on the skin and sets well within seconds. It helps in naturalizing the powdery look of makeup and settles into a somewhat dewy finish. This setting spray encapsulates patented temperature control technology, which enables it to give the makeup good staying ability. This weightless spray has been clinically tested to suit every skin type. It is suitable for oily and sensitive skin as well. It makes the skin look smoother. Makeup does not melt, fade or smudge for quite a long time after using this spray. It gives a natural looking finish to the makeup and erases the cakey look of powder. This fine mist does not feel heavy on the skin. It sets in quickly on the face, without making you to wait before going out. This setting spray helps in correcting the makeup flaws, which is a big plus. It adds a healthy, dewy glow to the face that pictures well. All Nighter Long-Lasting Makeup Setting Spray does not feel sticky on the skin. It will not make your skin stretchy either. The microfine mist delivered by this spray is extremely light and can be hardly felt. If you prefer a matte finish for your makeup, this setting spray is certainly not the right pick for you, as it gives a dewy finish. The product gets over pretty quickly. All Nighter Long-Lasting Makeup Setting Spray is a quality product and though it might not be able to deliver 100% of all the tall claims, it works decently as a makeup setting spray for any type of makeup. However, it is pricy and according to all the users it gets over quite quickly. So, unless you are comfortable with the price and looking for a dewy finish in your makeup, you might give it a miss. Are you looking for a pocket friendly makeup setting spray that really works for the oily skin? You might give the Gerard Cosmetics Slay All Day Setting Spray a try. It has got rave reviews from the users and comes in different bottle sizes to suit your need and budget. This setting spray is quite popular amongst the teenagers and college goers. Let us take a quick look at the product to make our own stand. This makeup setting spray contains a bunch of chemicals for offering the makeup-setting ability as well as some skin nourishing ingredients. Apart from Niacinamide it also contains hydrogenated castor oil and lemon grass oil that helps in improving the texture and complexion of the skin with use. This makeup setting spray is best applied over fresh makeup. The application is easy as the mist is dispensed through a nozzle in a controlled fashion and a single spray only releases just the right amount of mist for application. However, you should shake the bottle well before use and spray it on your face holding at an arm’s distance. Though it is a makeup setting spray, according to some users, if you are trying to ward off the problem of excessive oil and sebum, you might also apply it on fresh skin under the makeup for best results. According to the users, Gerard Cosmetics Slay All Day Setting Spray might not be the only Best Makeup Setting Spray for Oily Skin but it certainly delivers what it claims. Even if you have extremely oily skin and you are going out in a sunny day when the temperature is quite high, this setting spray will keep your face free of oil and sweat for quite long. The menthol present in its formulation gives a cooling effect on the skin, which can be really enjoyable during hot summer days. Easy to apply and absorbs quickly into the skin. After you have sprayed the mist onto your face, it takes only seconds for it to get absorbed completely without leaving any residue. Locks in makeup and helps in delaying melting or smudging even if the temperature is high and the weather is humid. It helps in improving the look of the makeup but does not destroy the fine contouring. The product combines botanical ingredients that are good for the skin. This makeup setting spray is available in different flavors like cucumber, peach and others to choose from. It gives a smooth finish to the makeup that looks fresh. The makeup setting ability of this facial spray is short lived. If you have really oily skin and you are out in a hot and humid day, it will not make your makeup last more than 2-3 hours unless you reapply. Gerard Cosmetics Slay All Day Setting Spray is loved by many users. It gives a nice finish and also helps in holding the makeup on the face without fading or smudging. It gives the makeup a natural finish and helps in controlling oil and sebum. However, if you are looking for a long setting facial spray for your makeup this is not the best pick. How to choose the Best Makeup Setting Spray for Oily Skin? In order to get all the best benefits of a makeup setting spray, it is really important that you use a good quality one. Good products come for a good price but they also offer the best benefits as claimed. However, even if you are buying a quality makeup setting spray, before making the purchase there are few things that you should consider. This is one of the most important aspects. Even a good quality and expensive product might not actually give you the best results if it is not formulated for your skin type. So, before you spend your money on a product check out the reviews and try to find the best makeup setting spray that will suit your oily skin. 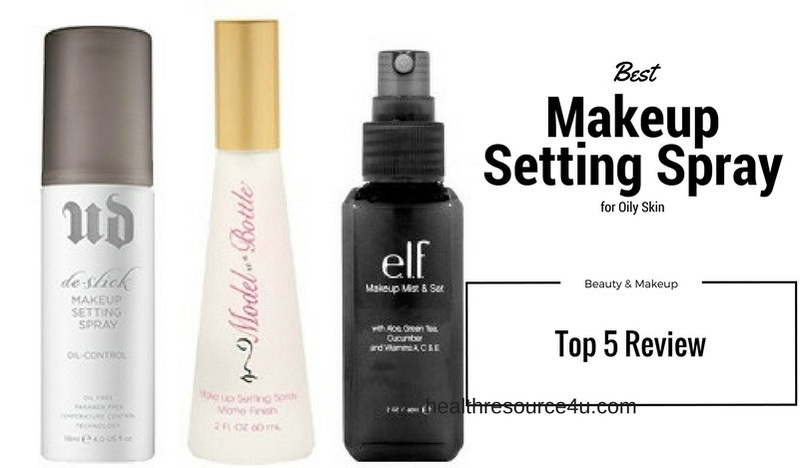 While choosing a makeup setting spray it is also important to consider what you exactly need. Are you looking for a makeup setting spray that is good to last your day in the office? Or you are looking for a makeup setting spray that will keep your makeup in place even if you are active on the dance floor? If you are going to be under the sun for a long time in a hot and humid day then too you will need a much stronger makeup setting spray than the one you might need for holding your makeup at place when you are in office. So, choose accordingly. 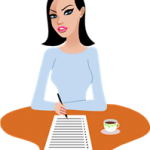 Your budget is certainly a determining factor when you are buying any cosmetics. Makeup setting sprays are available for a wide price range, and your aim should be to pick the best one for your skin type staying within your budget. Doing some research and checking out the reviews of the Best Makeup Setting Spray for Oily Skin in different price range will help you to make the correct decision. The market is crowded with various makeup setting sprays and all of them claim to be good in their niche. 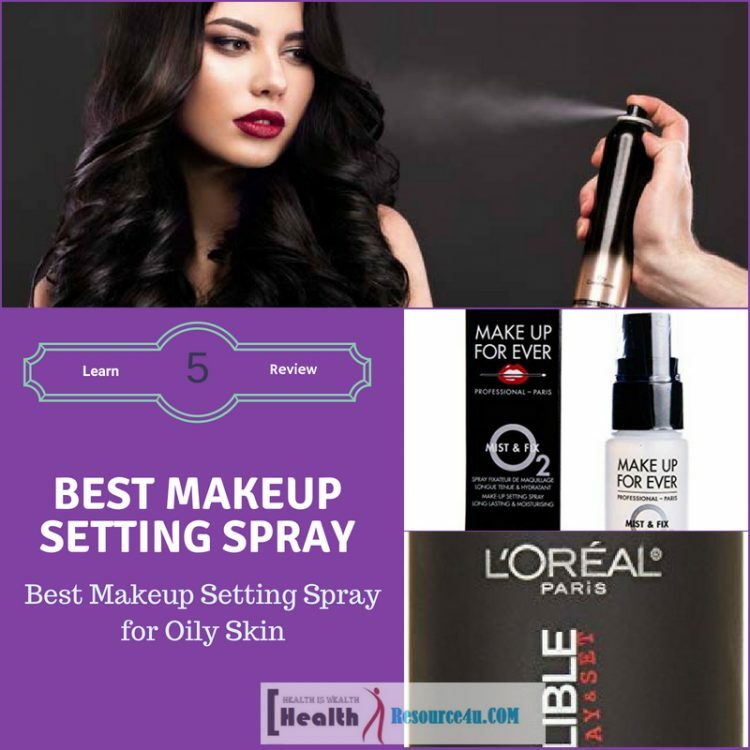 In this article we have included the Best Makeup Setting Spray for Oily Skin from different price range so that you can pick according to your needs. Good quality makeup setting sprays can actually add life and longevity to your makeup and will also help in improving your skin in the long run. Ananya is a professional fashion and beauty blogger with avid interest in Cooking, Traveling and Science.